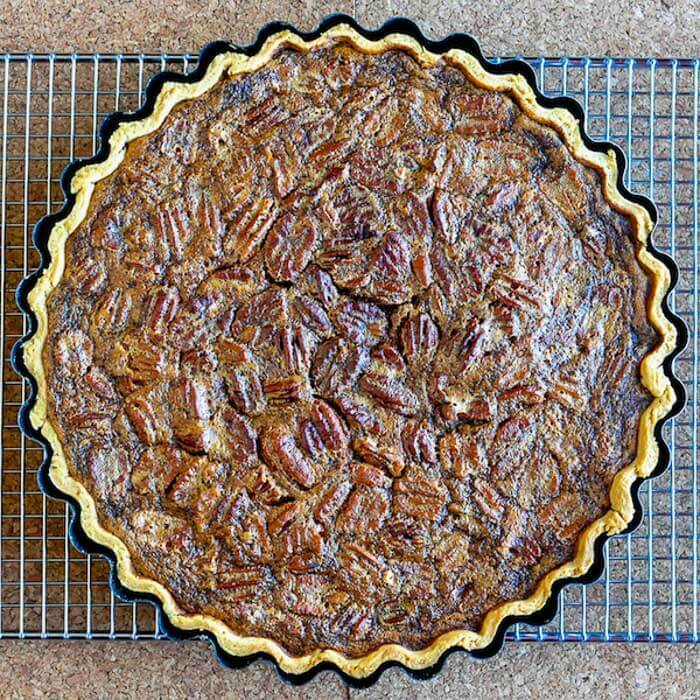 Perfect Pecan Pie - a real deal, old fashioned recipe! Perfect Pecan Pie. 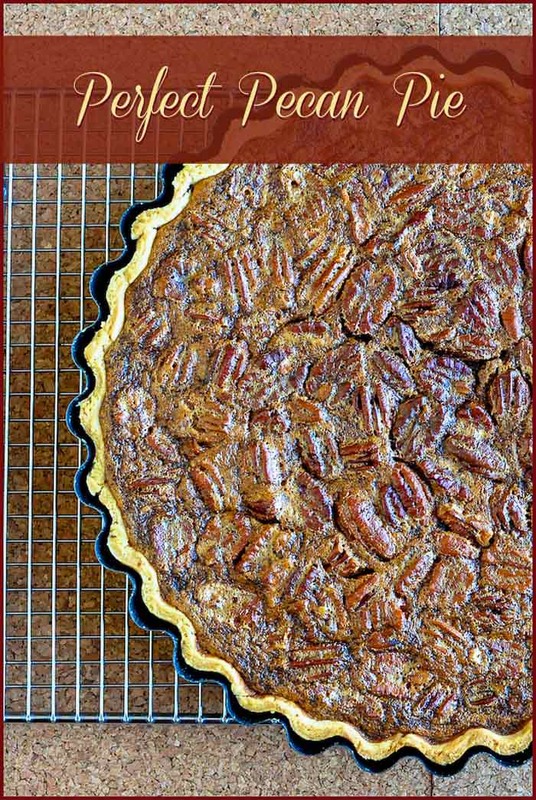 Trust a true pecan pie lover who has been using this recipe for over 30 years. I’ve never had better. Pecan Pie is my favourite pie. I’ve been making it for 30 years or more and it is always on my table on Christmas Day as a treat for after every Christmas dinner. It’s been served up as dessert for quite a number of Thanksgiving dinners too. Although my love for this pie is well established, we have a very intermittent relationship. Because I simply cannot resist this one, I don’t make it all that often. It is one of those desserts that I covet and uncharacteristically do not willingly share. If it is in the fridge, it calls to me. I find myself making several trips, knife in hand, to cut small slivers which I eat throughout the day. I would probably polish an entire pie off in two days in tiny slices if left to my own devices. Little slices don’t count anyway….right? 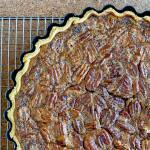 Like this Pecan Pie recipe? Check out our collection of Rock Recipes Top Ten Most Popular Pies. Many people have asked about the large fluted pie pan I use for this recipe. It is a great size and depth for this recipe. It was a gift form a friend but you can find it on Amazon by clicking the photo. 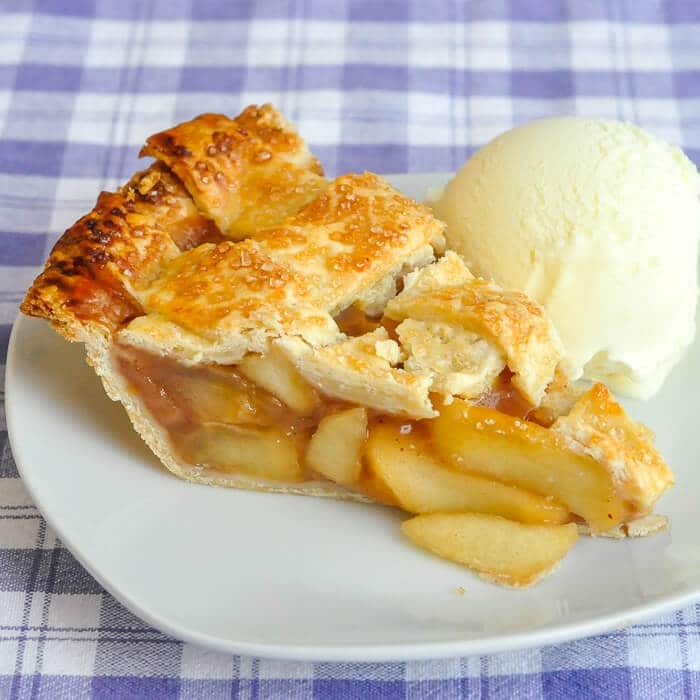 If you like this recipe you may also want to try learn my secret to the Best Apple Pie. Hint: it’s about the filling! 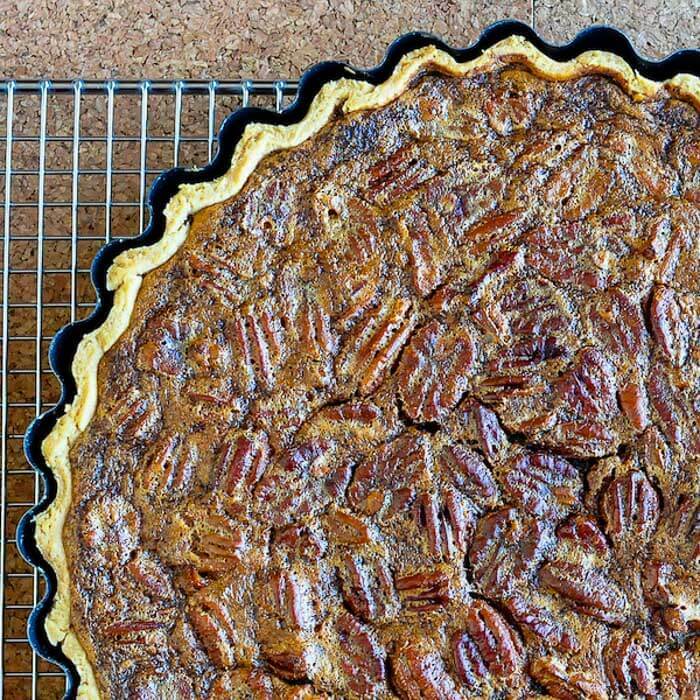 Making the perfect pecan pie is easier than many people think. This is the same easy recipe that I've used for decades. Make sure you are using a large enough pie plate as well or the filling will be too thick, a shallower pie is better for setting. I bake it in a 10 inch pie plate or even an 11 inch tart pan. 1/4 to 1/3 cup ice water + 2 tbsp white vinegar added Only enough liquid to make a dough form. Roll the dough into a 12 - 14 inch round and place in the bottom of a 10 inch pie plate. Push the dough into the corners and ensure that it is not stretched at all or it will shrink from the edge. Trim dough to a half inch past the edge of plate. Fold the ends under and finch with fingers or fork to shape the edges into whatever design you like best. Place in freezer while you prepare the filling. Whisk the eggs, brown sugar, corn syrup, vanilla and melted butter together until the brown sugar is dissolved. Bake for 50-60 minutes at 375 degrees F (350 F for glass bake-ware) or until the center is set and jiggles like jelly. Cool completely before serving. The amount of eggs is important in this recipe. I generally use extra large eggs in this recipe. If not using the largest size eggs available, it shouldn't hurt to add an additional egg. In reading some comments from readers I suspect all corn syrup is not the same in all places. Here it is very thick. Thicker than molasses at room temperature. If your corn syrup isn't that thick be sure to add that extra egg as insurance that the pie will set. Make sure you are using a large enough pie plate as well or the filling will be too thick, a shallower pie is better for setting. I bake it in a 10 inch pie plate or even an 11 inch tart pan. As long as the crust doesn't burn, an extra few minutes in the oven should not be a problem if needed as well. Making this pie right now but the directions say to divide the dough in 2 and refrigerate but nowhere does it say how to recombine them. This part is too vague. Is it for 2 crusts or should they be combined while rolling them out… hmmmm. Sorry, I should have added that you can freeze one for later. hi there – could you further explain this sentence: Trim dough to a half inch past the edge of plate. Fold the ends under and finch with fingers or fork to shape the edges into whatever design you like best. I am confused as to how to do this step. Also, with the above comment, does this mean that I could halve the recipe to make dough for one pie rather than 2? Yes, half the pastry recipe if only making one pie, or freeze the second round for later. Just trim and flute the edges for the pie in any way you like. The pie in this photo was baked in an edge-less pan, so it wasn’t necessary. I can’t seem to find what temperature to cook this at. Help please!!! Sorry, that was a copy and paste error when I updated the website. Fixed now. Thanks for letting me know. On the downside, now all I can think about is Pecan Pie! I only make it a couple of times a year because it is one of the few desserts that i won’t stop until it’s gone. Absolutely love it! Any recommendations for baking this in high altitude? I live next to the ocean so I’m afraid I have no experience at all with high altitude baking. Although this pie doesn’t contain baking powder or soda , so what would possibly be the issue? Not sure I understand your question completely,. Well I live in Colorado and I’ve heard that pecan pies can be tricky in the high altitude for whatever reason I don’t know. Someone told me it blew up in their oven! lol but I can’t find any other recipes besides the Karo one that has high altitude adjustments…guess I’ll give it a try! The ocean is at my back door. I have no experience at all in high altitude baking I’m afraid. I tried this recipe and for some reason my filling never set. I cooked it according to directions and when it was cooled completely I cut into it and the filling was still liquid. so I baked it some more and cooled it again and when I cut it the second time it was still liquid. I ended up throwing the whole thing away. The flavor was great it just never set. any suggestions? Tha’ts Odd. I’ve been using this recipe for a very long time. Maybe the size of your eggs? Barry, This was the most amazing recipe! Thank you for sharing it. One of the few desserts I make that I have absolutely no self control over. I absolutely love it! It’s on my Christmas dinner table every year too. Oh my goodness!! I just made this pie and it is AMAZING! No wonder you only make it once in awhile, I am having trouble not eating it as we speak. Thank you for an awesome recipe! OH my Lord, Carla, I’d like to have a big slice of that right now. Just irresistible! I’ve tried this recipie similar in the past, and I too had problems with the filling not setting. I thought the liquid, butter , eggs and syrup seemed to add up to too much liquid? It always, always works for me. Maybe it needs to be in longer in your oven or the egg size is too small. Adding an extra egg might be the way to go. Do you think you could substitute the dark corn syrup for light? A few days? I do refrigerate it anyway but would only make it a day or two in advance. If I use a frozen crust from the store should I bake it first? This recipe looks delicious but since I don’t have a food prossesor, but can I use anything else to make the dough. I have a Kitchenaid mixer? Any help would be greatly appreciated!! No don’t use a regular mixer, the crust won’t be flaky. Just cut the butter through the flour with 2 knives. I did the filling recipe for my own crust, and I did a smaller 8 inch pie. NO CHANGES TO THE FILLING and it only fit in one pie. So, make sure you have enough ingredients to do two. Because, I had to make a trip to the grocery store to get more corn syrup and pecans. I’m not sure you got the size correct. This would never fit in my 8 inch pie pan. Do I grease the pie pan. I never have. Pastry generally does not stick to anything. I’m trying this recipe right now, hope it turns out good! It’s for our thanksgiving dinner tomorrow ….wish me luck going in oven now. 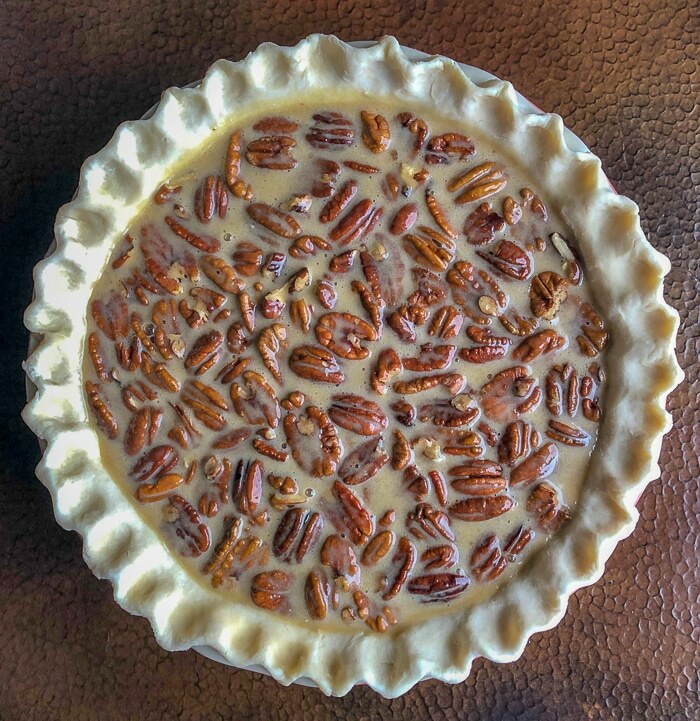 Recently, I asked my son if he would like me to bring this pecan pie recipe for Thanksgiving. He said, “No, not on Thanksgiving but would you bring it on Friday?” Quickly, I asked, “Why on Friday?” His response, …”Because everyone will be gone on Friday so I can eat more of the pie. Mom, it would be just fine to pick up a cherry pie for Thanksgiving.” His humor was cute…but very much likes YOUR recipe! Thanks again. Have a Happy Thanksgiving with your family! Many of us appreciate your gift of cooking. That is odd. I wonder sometimes about the difference in consistency of the corn syrup that some people are using. I’m suspecting that there is a big difference between brands. The one I use is really thick. I’d recommend adding an extra egg next time. I have never had this pie fail for me in 30 years so I am surprised. I have added a couple of notes to the recipe in response to a couple of comments. I made it and it looks great…I am taking it to my in-law’s for a late Thanksgiving dinner tomorrow night (later today, it’s 12:00am) so I can’t taste it. My only concern is that the crust appears to be burnt. I guess I need a crust cover or put foil over it while it bakes. Any suggestions? My husband and his dad LOVE pecan pie so I tried it for the first time. Yeah, a foil collar around the crust often helps with many pies. Try that next time. My pie also had a liquid center. Added all ingredients as instructed. Used xtra large eggs, The crust was quite brown so I couldnt bake any longer. Luckily I had another dessert ready. I wonder if I mixed the ingredients for too long? I never have an issue. I’m wondering if it is the size of eggs in some locations. It won’t hurt to add another egg next time. That should fix it. I might make a note on the recipe. Made the filling and added to a pre made pie crust. It was delicious but a little runny, any suggestions on how to avoid that? I’ve added a note to the recipe for your information. I have pecan pie in the oven as I type this. I used store bought shells (busy momma here!).. and filled 2 of them. I have never made pecan pie before – had it or the first time this year. Decided we would have it for Christmas. I am very excited about it. It was easy to make. I hope it sets up nice for dessert tomorrow. Reading the reviews I do have to wonder if corn syrup is different in the US as compared to Canada. The corn syrup I used actually has a pic of pecan pie on the label! I assume it is the right stuff. I wonder about that too. The stuff I get here is thicker than molasses even when at room temperature. The pies were perfect! Thank you, Barry. hi what kind of vinegar do you mean? I have white wine vinegar or distille white vinegar. Hi, I am from Australia and my husband brought back some corn syrup from Canada for me so I could bake this recipe. I am reading the comments about the uncooked filling and hoping my corn syrup is going to work. The brand is Crowns. Will that one work? what brand do you use? I made two pies, added two extra eggs total to filling since I had 9 inch plates. Pies really puffed up 3/4 way through baking and they turned out nice, especially for my first pecan pies. I’m wondering though, my crusts are a bit soggy on the bottom even though the filling is set. Should I have added more egg? I could make the crust a little thicker maybe. Your pic shows a nice bottom crust so I know it’s possible, just have to figure out how to do it right. Thanks for your recipe! One more thing-these do not need refrigeration to cool do they? Are you using convection bake? I find bottom heat is best for pies and always lower the rack so that it heats up well on the bottom. You can also try a higher temperature for the first 15-20 minutes to set the bottom crust. Are you using light brown sugar? Can’t wait to make! Hi! 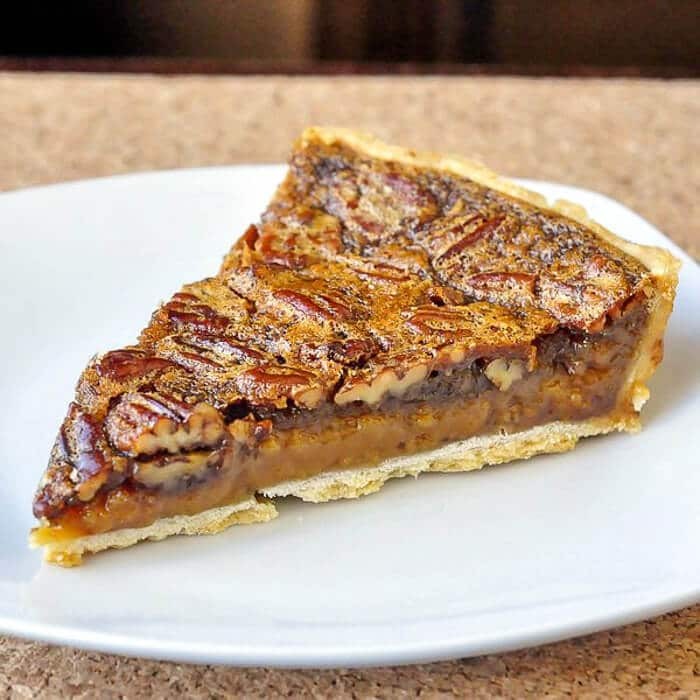 I made your butter tarts and they were so yummy, I thought I’d give your pecan pie a go too! I noticed the tart recipe called for pastry flour, but the pie crust here says to use regular flour….is that required or can I use pastry flour?